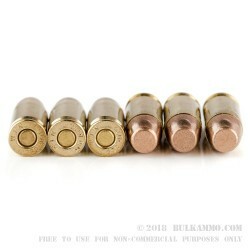 A simple and easy to love .380 practice round that is perfect for the range and general target use and is not nearly as unreliable in newer, tighter, small framed .380’s as is most other ammunition. 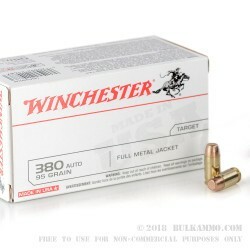 The relatively punchy powder charge and good overall cartridge dynamics of this Winchester load makes it function well with most of the mainstream .380 Autos that are available on the market. 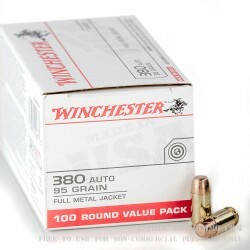 A great range package for volume shooting of your finicky .380 auto firearm. The venerable Winchester White Box is a classic choice among shooters everywhere and the Made in the USA stamp offers a bit of credibility to the Winchester brand that already has quite the reputation for delivering on promises, with more than 150 years of firearms industry history. 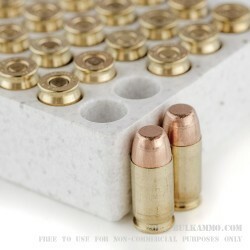 You’re getting 100 rounds of ammunition that is utilizing a straightforward FMJ (full metal jacket) projectile with a flat nose and a brass case with Boxer priming. This cartridge casing is easily reloadable and offers good functionality in many hard to please .380 Auto firearms. The 95 grain projectile is a heavier bullet for the caliber and offers good performance; it is suitable for use in any .380 Auto firearm.